The tricuspid leaflets coapt during systole to facilitate proper valve function and, thus, ensure efficient transport of deoxygenated blood to the lungs. Between their open state and closed state, the leaflets undergo large deformations. Quantification of these deformations is important for our basic scientific understanding of tricuspid valve function and for diagnostic or prognostic purposes. To date, tricuspid valve leaflet strains have never been directly quantified in vivo. To fill this gap in our knowledge, we implanted four sonomicrometry crystals per tricuspid leaflet and six crystals along the tricuspid annulus in a total of five sheep. In the beating ovine hearts, we recorded crystal coordinates alongside hemodynamic data. Once recorded, we used a finite strain kinematic framework to compute the temporal evolutions of area strain, radial strain, and circumferential strain for each leaflet. We found that leaflet strains were larger in the anterior leaflet than the posterior and septal leaflets. Additionally, we found that radial strains were larger than circumferential strains. Area strains were as large as 97% in the anterior leaflet, 31% in the posterior leaflet, and 31% in the septal leaflet. These data suggest that tricuspid valve leaflet strains are significantly larger than those in the mitral valve. Should our findings be confirmed they could suggest either that the mechanobiological equilibrium of tricuspid valve resident cells is different than that of mitral valve resident cells or that the mechanotransductive apparatus between the two varies. 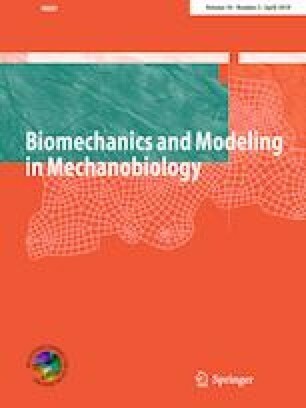 Either phenomenon may have important implications for the development of tricuspid valve-specific surgical techniques and medical devices. The online version of this article ( https://doi.org/10.1007/s10237-019-01148-y) contains supplementary material, which is available to authorized users. This study was supported by an internal Grant from the Meijer Heart and Vascular Institute at Spectrum Health.